Popular This Week: Purchase Materials and Supplies: Purchase Orders RCM and more! This week, we are highlighting the Top 5 Pages on KnowledgeLeader from March 11-15! Take a look at the "best of the best" of our tools that could help you simplify your audit projects. A successful risk management strategy requires a strong internal control environment. The risk control matrix (RCM) format emphasizes that strong and risk-oriented internal control environments are often optimized with automated/manual controls, depending on the situation. 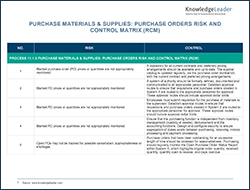 This document outlines risks and controls common to the purchase order (PO) aspect of the 11.1.3 Purchase Materials and Supplies process in a risk control matrix (RCM) format. This policy outlines guidelines and accounting policies to ensure that inventory is properly controlled and costed, and losses or shortages are prevented. It applies to all inventory items, including raw materials/parts, work in progress, and finished goods and consigned inventory. The procedures focus on inventory valuation, slow moving and excess inventory/reserves, reconciliation of perpetual inventory, physical inventory, consigned inventory, scrap, intercompany transfers, and capitalized cost. In this sample, inventories are stated at the lower of cost or market. The valuation method for each item of inventory shall remain consistent from one accounting period to the next accounting period. A successful risk management strategy requires a strong internal control environment. The RCM format emphasizes that strong and risk-oriented internal control environments are often optimized with automated/manual controls, depending on the situation. This document outlines risks and controls common to the 5.2.1 Process Accounts Payable process in a risk control matrix (RCM) format. This sample report summarizes an internal audit review of an organization's incentive compensation process. The report includes an executive summary, description of audit work performed, process maps of the audit area, and recommendations. The main objectives are to obtain an understanding of the key financial and administrative processes associated with incentive compensation and to evaluate the adequacy and effectiveness of the associated internal controls.